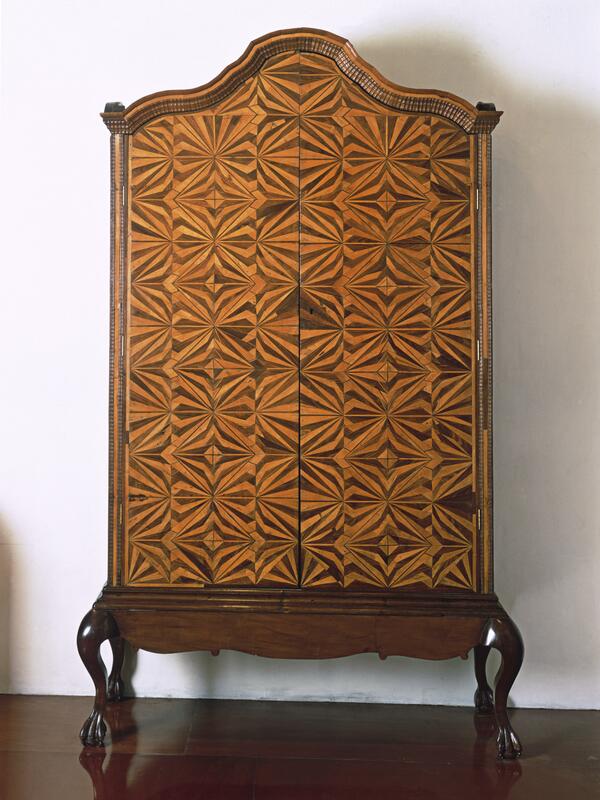 The armoire, as a piece of furniture, has French origins. The style of this piece is English, and the star pattern of the inlay is evocative of mudéjar (Ibero-Islamic) design. Such a visually successful integration of diverse elements is characteristic of Spanish American furniture makers. The city of Puebla, an important city in New Spain, was a center for inlaid furniture, and this piece may have been made there. The molded cornice of the wardrobe is evocative of 18th century architecture in that city. The artisans making this piece carefully cut different colors of wood to create a design that looks like pleated paper. The visual effect is restrained and elegant. The legged base of the armoire is new, probably carved to copy the original base, which would have been damaged through decades of use. 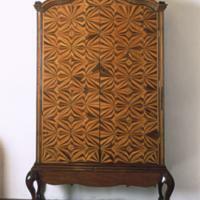 A master craftsman would have made this armoire, although furniture from Spanish America can rarely be attributed to a named artisan. It measures 230 x 140 cm, and is 52 cm deep. Objects such as this one clearly show the level of craftsmanship extant in New Spain in the 18th century, and suggest something of the tastes of wealthy urban consumers. At the same time, the armoire, with its origins in the 18th century, reveals shifting patterns of daily life—how and where one stored clothes was itself a practice intimately bound up with social conventions that had distinct and mutable histories. Aguilera, Carmen, et a. 1985. El mueble mexicano. México, D.F. : Fomento Cultural Banamex. Bomchil, Sara and Virginia Carreño. 1987. El mueble colonial de las Américas y su circunstancia histórica. Buenos Aires: Editorial Sudamericana. Rivas, Jorge F., "Domestic Display in the Spanish Overseas Territories." In Behind Closed Doors: Art in the Spanish American Home, 1492-1898. Richard Aste, ed. Pp. 49-103. Brooklyn: Brooklyn Museum of Art and New York City: Monacelli Press.